After a massive 9.2 magnitude earthquake in 1964, Alaska's Copper River Delta experienced a significant land lift. Since then, the ecosystem of the delta has shifted dramatically, making it a hotspot for climate scientists to study the ways species adapt to rapid habitat change – that parallels the ways we must adapt to a changing climate. This chapter of the award-winning Science and Memory project explores the unfolding migration story of the dusky Canada goose. Melissa Gabrielson parks the airboat and carries her gear towards the banding area, where she will work with a group of volunteers for approximately eight hours banding dusky Canada geese. Over the course of two days, banders corral approximately 600 birds into a pen, attach bands, take measurements, and release them back onto the Delta. A volunteer uses a net to catch a goose from the holding pen for banding. The process continues for several hours each day. Dan Jenkins gives a goose to volunteer Ben Hammer, to be transferred from the holding pen to the hands of a bander. 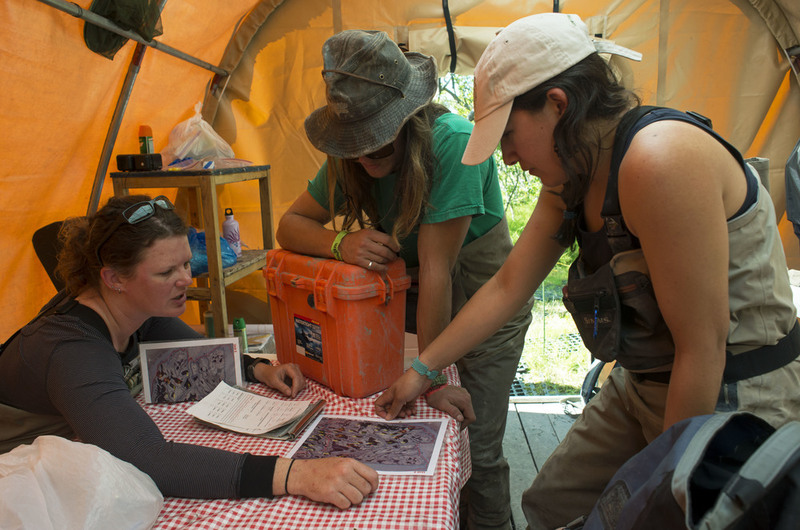 For the benefit of hunters and dusky populations alike, volunteers from the Forest Service and Fish and Wildlife work to maintain a target population threshold of 10,000 – 20,000 dusky Canada geese. Banding allows these organizations to track population numbers and migration routes, implementing certain hunting and management regulations as the population changes. Dan Jenkins and James Benson wait to hand the next geese over to the banders. With heads tucked under their wings, the birds remain calmer. 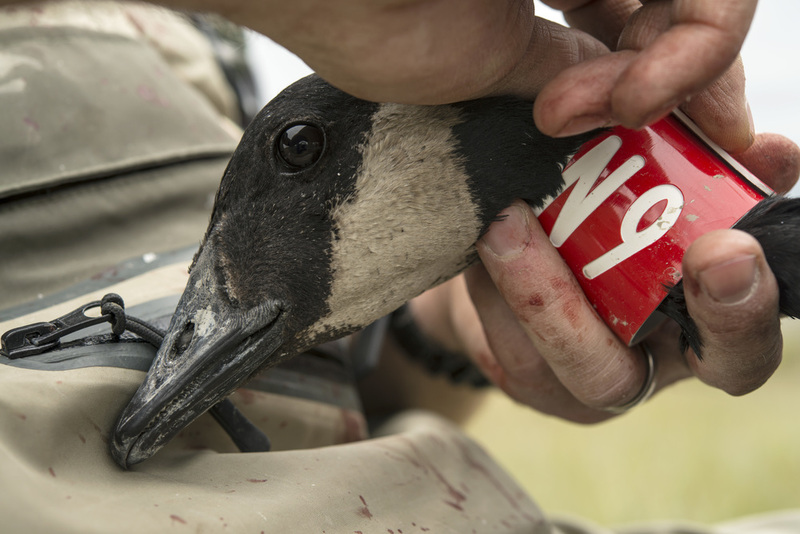 Mike Petrula prepares a red collar to attach to a goose’s neck. The dusky Canada goose population has decreased in recent years, due to a changing habitat type on the Copper River Delta. Red collars attached to the birds are used in the wintering season for re-siting the birds. Banders pluck a feather from the dusky Canada goose for DNA testing. Although it may draw blood, the process is quick and painless. Melissa Gabrielson examines the map of nest islands with James Benson and Erica Gaeta. The team formulates a strategy to maintain the islands in need of maintenance within one given area during their four-day stay at Dusky Camp. Melissa Gabrielson drags her poke boat behind her toward the next nest island on her list. 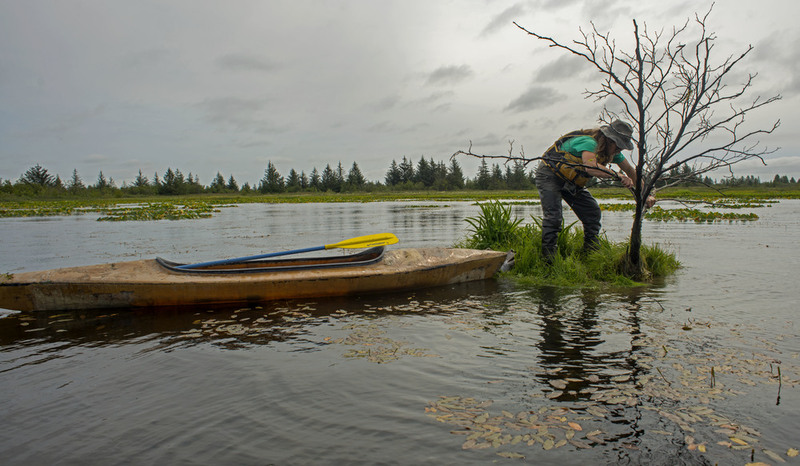 The crew uses poke boats to carry shovels and maintenance tools through brush and paddles across ponds, sloughs and beaver dams to reach the artificial islands. Melissa Gabrielson and Dan Jenkins attach new anchoring to a nest island. Anchors on the floor of the pond keep the island from drifting across the pond. James Benson removes shrubbery to clear space for sweet gale to improve a nest island floating on a pond in the Copper River Delta. The crew will camp in a remote area on the Delta for a week at a time throughout the summer to maintain the nest islands after dusky nesting season concludes. In the spring, birds flock to Cordova, Alaska for nesting season. the dusky Canada close, a subspecies of the Canada goose, uses the marshy grass-filled Copper River Delta as its sole nesting habitat. The ecosystem of the Copper River Delta changed abruptly when a 1964 earthquake lifted the wetland, turning it from a saltwater to a freshwater-dominated system. Where at first the dusky Canada goose population spiked post-1964, it has since sharply decreased due to this change in habitat type over time. Shrubs and trees have grown, and skies now have less protection from predators such as bears, wolves, coyotes and bald eagles. Fewer duskies nesting on the Delta means the implementation of stricter hunting regulations in Oregon and Washington – the duskies’ wintering grounds. According to a U.S. Forest Service report, these restrictions could limit recreational activity and have large economic impacts on agriculture in Oregon due to the population increases of other geese subspecies formerly controlled through hunting. Thus, the dusky Canada goose is considered a species of concern.